ANCY !! | SnL World !!! After saying good night to my parents I entered my room which was as usual messy. I love to see my things in messed up manner rather than organized. I said my prayers and was above to drift to sleep when I realized I have to search a name for my new pup. Hold on…pup is not even born… I do not even know whether the pup‘s mom is pregnant. But crazy me, already busy with my first task. After doing some R&D I decided to call her Ancy. That was the first time I called that name, not knowing how important that name will be to me. After one month I got a call from my aunt. She said you can come and collect your pup. I was all excited. I went to my aunt’s house to collect my pup, my Ancy. She was sleeping in the hall. She was so adorable I just lifted her up and kissed her on the cheek .She opened her small eyes to see her future owner. I guess she recognized her soul mate. As she was in a new place she was a bit scared. I can’t forget that moment when for the first time I held her in my arms. 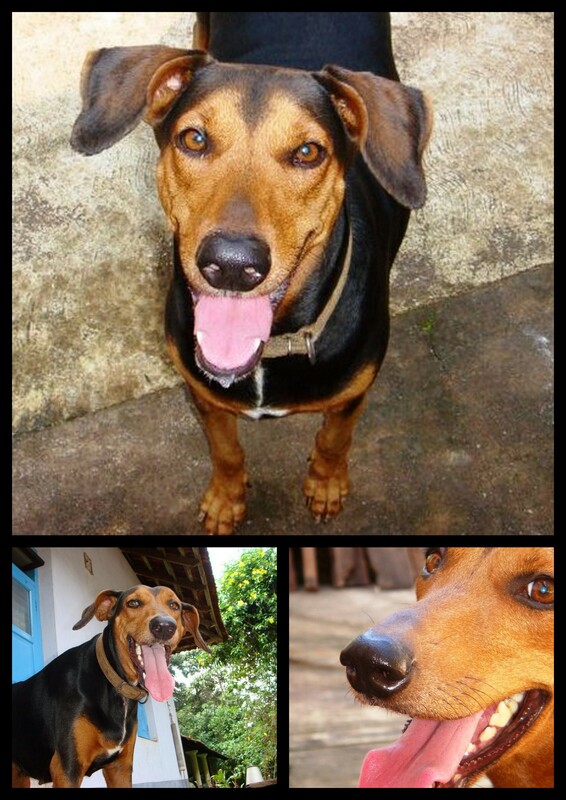 She was a Doberman crossed breed with black and brown color. I started to take care of her like small baby. I used to share my snacks with her. She loved Maggie. I used to take her for walks and make her run. She was growing like any other dog but only difference being that she was dependent on me. Wherever I go she used to go else she used to sit in one place. My dad and mom i.e. Mr. Lobo and Mrs. Lobo loved her too. She was everybody’s “honey”. I used to give her medicine, bathe her, clean her sleeping place, pray for her and finally say good night to her. When she was 3 months old everybody eyes were on her tail. They say a short tail is Dobermans trademark. Thanks to Mr. Lobo he didn’t want her tail to be trimmed. Mr. Lobo’s first rule was never to take a dog inside the house. Who cares when Mr. Lobo is not around, I used to take Ancy inside and used to give her a grand tour. Bread, rusk were Ancy’s favorite. Mr. Lobo is known for his anger and is a terrific man. Even Ancy was aware of that and was scared of him. Mr. Lobo’s son always hated the dog. When I used to fight with him he used to chase me and beat me up. I used to call Ancy. Like a guardian angel she used to appear and stare at the chasing person. Mr. Lobo’s son stopped beating me in front of Ancy. Sometimes I used to beat him up and run towards Ancy. Poor Mr. Lobo’s son, he used to stand at a distance and watch us. One bad day when I was alone at home Ancy had a bad health problem. She had worm’s problem. She used to poo every now and then. I could not see her suffering. I didn’t know what to do as I didn’t have money. I called the doctor and he said that he will come in an hour. Thank God by the time he came, Mr. and Mrs. Lobo were back from their destination. Ancy’s bad day she got an injection. Poor baby. I decided to join StAgnes for my B.Sc. which required me to stay in a hostel. As my house is in an interior place, Mr. Lobo ordered me to stay in a hostel. Nobody dares to say no to Mr. Lobo. On the day of leaving I cried. I didn’t cry because it was the first time I stayed away from my parents, nor was it because I was gonna stay far away. I cried because I was leaving Ancy. She just sat on her place n saw me leave. First day in hostel I missed everyone, my house, Mr. n Mrs. Lobo. Thanks to my roommates they soon made forget the misery. That night I cried listening to dogs bark because they reminded me of Ancy. That was the first night I missed saying good night to her. Time passed by, Ancy was 3 years now. Every month I used to see her. I was happy to see that she missed me too. I completed my B.Sc and joined Nitte for MCA. Again hostel life. Ancy was doing really well. She was a smart dog. Once my dad took the stick to hit me because I back answered him. I was over moon to see that Ancy was about to bite my dad at that very moment. It was a tremendous feeling to realize that somebody loves you so much that they can’t see you get hurt. My dad was touched. By then everybody used to say that Ancy belongs to Sylvia and both Sylvia’s and Ancy characters are similar. Even though they compared me with Ancy I never felt bad. After all she’s was my dog. Mrs.Lobo called me. I was sleeping as I was tired from my journey. Mrs. Lobo said she couldn’t find Ancy. This was not Ancy nature; one call from the Lobo’s and she used to appear. I started calling her. Once, twice, thrice…no reply. I knew something was wrong. I started to search for her. Finally I found her lying on the floor a bit far away from my house. When she saw me she tried to get up but couldn’t. I ran towards her and talked to her. She seems to understand me and closed her eyes. She was relieved because I was with her. I called my Mrs. Lobo so that she could help me shift Ancy to our house. Ancy was heavy, with great difficulty we shifted her. Mr. Lobo not aware of anything was sipping his morning coffee. When he came to know, he was upset and hurried to see Ancy. He said “forget her you can’t save her. Her time has come.” I was not ready to accept that fact. She had severe worm’s problem. Her tongue was hanging outside and she was fighting death to come back. I couldn’t see her. I started home medicine. I didn’t lose hope. I started giving her medicine. I couldn’t stop crying. I called the doctor too. He came, saw her and gave some more medicine. But her condition kept worsening. I tried my level best to save her. Every 10 minutes I used to give her home medicine. When she finally stops breathing I was there in front of her, comforting her. Seeing me Mr. Lobo said “forget her I will get you new pup” and he had put a sack cloth on her body. When nobody was there I went near Ancy’s lifeless body, lifted up the sack and touched her. I was telling her how much I am gonna miss her. I didn’t know that Mr. Lobo was watching us from far away; he said “you think if you touch her you can bring her back to life?” I was speechless. I didn’t have control over my tears. My eyes wear swollen. At the end of day Mr. Lobo with help of our neighbor’s boy was able to make arrangements for Ancy lifeless body in our garden. When I read this,I remember that every time you spoke about Ancy,your eyes would be filled with tears.Love this story! Ya…seems lik me too missing it so much, Miss u ANSII!! !